Sometimes things just don't go the way you want them to*. After cruising through the Canadian prairies, we made a quick detour South and crossed the border into the United States. This was a bit of a blow to the Canadian-ness of our roadtrip, but it was justified by saving us time and money (as gas prices are ridiculously cheaper there).It was going to be another very long day of driving, and we were hoping to pass through quickly, so we placed sweet-n-innocent-looking Katharina in the driver's seat and crossed our fingers. No such luck! We were quickly directed to drive into a bay where we were asked numerous questions and then scooted into a small waiting room. Strangely enough the window looking out to our vehicle was a one-way mirror in our favor, so we got to giggle as we watched the border guards struggle to open the trunk of our Grand Prix, setting off the alarm in the process. It doesn't have the usual release by the pedals, and there is no keyhole on the trunk...the only way to pop the trunk is to hold the lock switch on the driver's door for a few seconds. It took them about 10 minutes to admit defeat, and curtly ask Katharina to open it up for them, which she tried to do without laughing. After that they got to deal with our intense packing job, which they could not repack. And for all this trouble, the only thing they confiscated was a bag of oranges I had purchased the day before. I was sad. Once across the border, we navigated the American highways with mixed success. To our Canadian eyes they were not quite as straightforward or well marked as we were used to, so we ended up missing a turn somewhere, and added an unnecessary 1-hour detour to our 15-hr driving day. Then our highway abruptly came to end with an abundance of bright orange signs and precious little detour direction, so we drove around for a while before finding another way through, desperately hoping we were headed to Canada. Somewhere along the way, there was suddenly a thunderous noise from underneath us, and I turned to Steve and asked, "Is the car supposed to be making that sound?" 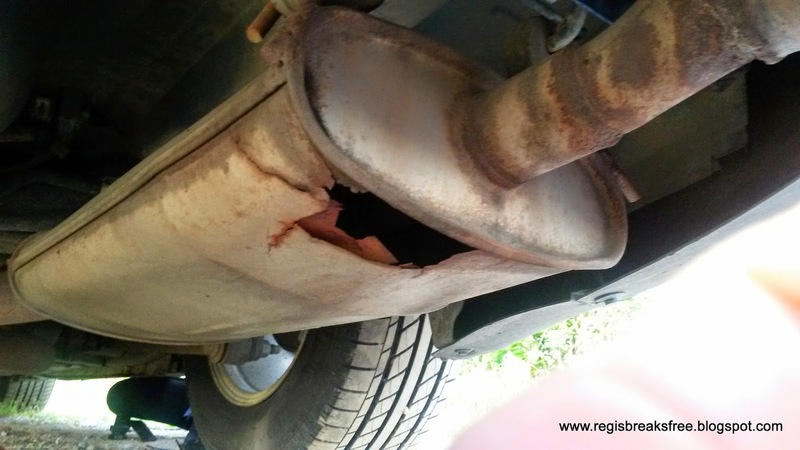 Turns out, our muffler went. Further inspection revealed a massive hole. 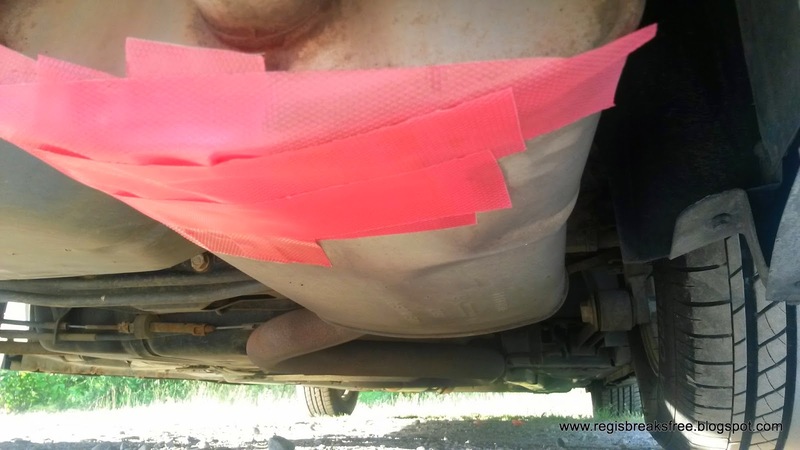 We attempted to patch it with special muffler tape, but as it turns out the damage was too great, and there was no salvaging it. Steve liked the new revving sound, nicknaming our Grand Prix "The Ferrari", but the rest of us were not so pleased about the constant headache-inducing roar which remained for the duration of the trip. Alas, also we took another wrong turn, but discovered our mistake within 15 minutes. However, it was starting to get dark and we were all getting tired. Disney sing-a-longs could only carry us so far. The gas pedal may have been pressed a little further than it should have been when the flashing red and blue lights illuminated our rearview mirror. We all groaned. The police officer that approached the window seemed like a reasonable fellow, and Katharina saved us all by playing the sweet-n-innocent card again, this time with success ("Our car didn't have a speedometer reading miles, we were keeping pace with traffic because we weren't sure how fast to go...")! We were let off with a warning! From there it was just a matter of a few more hours of driving, and we reached the Canadian border. This time we tried a new tactic. We placed bearded-and-tattooed Steve in the driver's seat, and crossed our fingers. The Canadian border guard asked, "Where are you from and where are you going? "...and after a cursory glance at our passports, practically waved us on our way before Steve had finished our story. We made it back to our homeland, and spent the night in Sault St. Marie, Ontario. *Because I made this announcement, I feel obligated to update you all and let you know that Steve and I are no longer together. This is sad, of course, yet I have nothing but good memories of our time together. The roadtrip has not been tainted for me so I will continue to document it, but maybe with fewer photos than might otherwise have been posted.